While one and a half days is not enough time to eat all the vegan goodness in Atlanta, I certainly tried my best. After the uber filling dinner of Delia’s, I lost a bit of time Tuesday morning due to the whole keys-locked-in-trunk thing. Thankfully I was still pretty stuffed from the night before, so missing breakfast wasn’t a big deal, but after getting some coffee with a friend at Cakes & Ale Bakery (so so darling–no pictures from that though), I was starving (and it was noon). 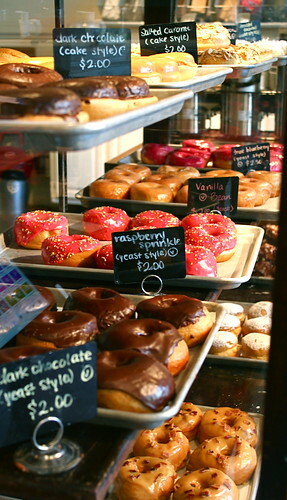 With so many vegan donuts available, it was almost impossible to choose. 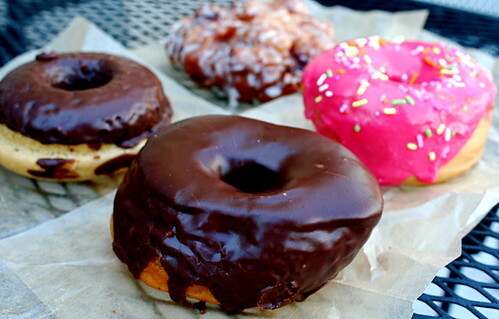 But choose I did–dark chocolate yeast, dark chocolate cake, raspberry sprinkle yeast, and apple cinnamon fritter. (Only one of these, the dark chocolate yeast, did I immediately stuff in my mouth, the rest I took to my brother’s family in the burbs that afternoon.) Favorite? Definitely the dark chocolate yeast doughnut. From the dark chocolate ganache to the pillowy yeast doughnut, there wasn’t anything I didn’t love about it. The cake version I found to be a bit dense, but the yeast one was light and not too sweet with just enough chocolate so that you got a bit in every bite. Runner up? The apple cinnamon fritter. I’m a big fan of fritter with large dice of apples, and this one did not disappoint. Also, the cinnamon wasn’t overpowering and added just enough spice to make you have an instant autumn moment (even though it was 80 degrees and sunny). As for the raspberry sprinkle–eh, it was good, but I didn’t feel like it was raspberry enough. I felt like I tasted more pink than fruit. Over all, Revolution has my vote for fantastic donuts that also just happen to be vegan! 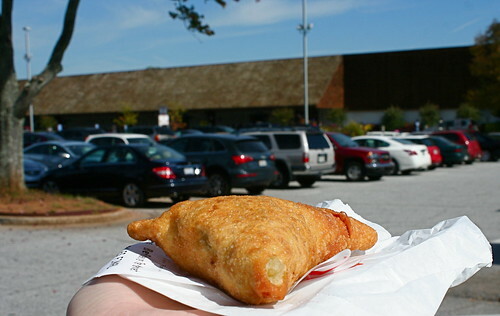 After stuffing my face with a some doughnut goodness, I drove east to the Dekalb Farmers Market. I’ve sung this market’s glories before, but since no photos are allowed on the premises, it’s hard to blog about. (And I will NEVER forgive David Lebovitz for trash talking the market–seriously ex-pat dude living in Paris, how dare you come on my turf and pooh-pooh one of the best things the Southeast has going for it? Shame on you. /end rant.) After filling my cart with everything from giant bottles of rice vinegar ($2.99 for a huge one) to bulk quinoa and spices, I was ready to check out–but not before I’d scored one of my favorite eats in the entire city: a vegetable samosa. 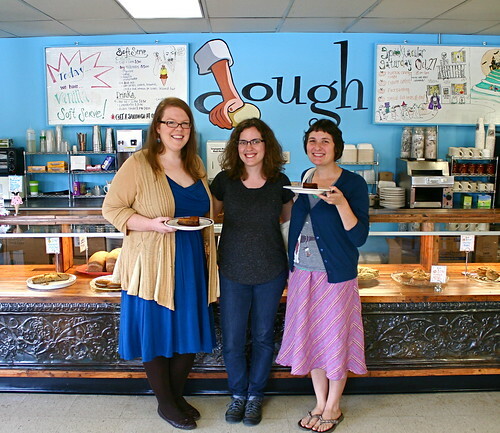 Fully snacked, it was time for a late lunch with two lovely Atlanta vegan bloggers, Becky of Glue & Glitter, and Adrienne of Crack the Plates, at Dough Bakery in Inman Park! I’ve been reading Becky’s blog for years now and even briefly met her in 2009 when I bought a robot themed dress off her Etsy site, and I got acquainted with Adrienne during last year’s MoFo when she blogged about awesome vegan places in Atlanta (obviously a subject near & dear to me). Since getting to know them in the blog world, I was excited to meet face-to-face and share a meal. I loved getting to know these ladies more this week, bug infestation stories aside (ha! ), and I definitely know the next time I’m in town that we’ll have to get another meal. Hooray for great vegan friends, both online & in real person! 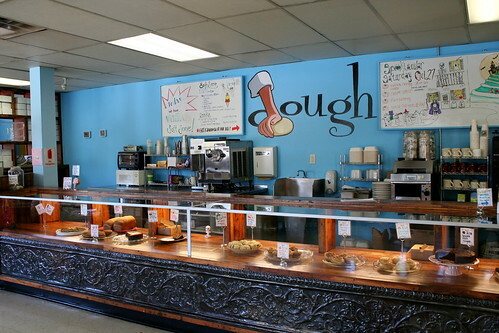 Dough Bakery is a little gem of a vegan bakery & cafe owned & operated by Laura & Kevin, in partnership with Simon of Gutenfleischer’s artisanal vegan meats fame. 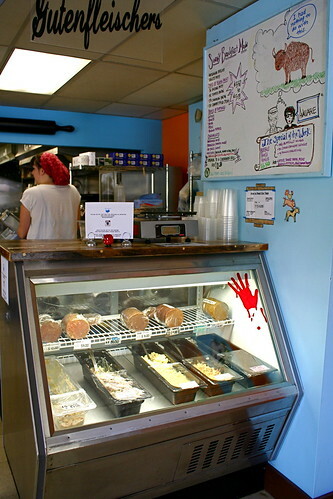 Located right next to the Inman Park MARTA station, it’s got great presence, facing the high-traffic Dekalb Ave. and, even though it was 2 pm, several people were in and out, order sandwiches or picking up baked goods. So awesome to see a vegan bakery/cafe doing well! 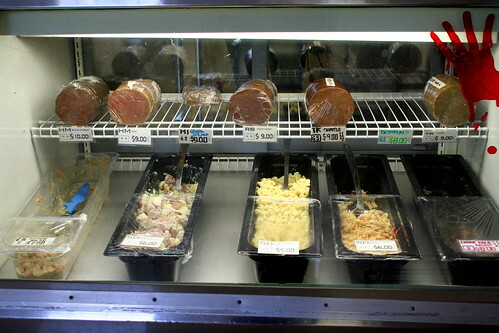 The bakery side offers vegan breads, brownies, cinnamon buns, cookies, and other assorted vegan goodies, but, given that my sweet tooth has relatively subsided these past years, the part I was most excited about was the Gutenfleischers deli meats partnership. Back in 2010/2011, several Atlanta bloggers started mumbling amazing news about artisanal vegan meats being developed in Atlanta. Already living up in Virginia at that point, I was bummed that I didn’t live in an area where I could try the deli meats and sausages that Simon was cooking up. Needless to say, a trip to eat the Gutenfleischers’ goodness was a top priority for my next visit to Atlanta! I sampled a few kinds and settled on the Genoa Salami which was, obviously, seitan, seasoned with peppercorns, fennel seed, garlic, and a bit of red wine. Building my own sandwich, it turned out as a salami, mayo, dijon mustard, American cheeze, lettuce, and tomato on wheat concoction and, frankly, it was killer good. Dough’s wheat bread is dense enough (but not too dense!) to work well as sandwich slices and the salami was slightly spicy and rich–perfect with the side Bahn Mi Pasta Salad. The meats are obviously vegan, I don’t think you’d trick an omni with them, but they’re unique and well seasoned–an omni wouldn’t miss the meat, they hold up well on their own. As for the bahn mi pasta salad? Whatever they put in that, oh man, I could eat a bucket. 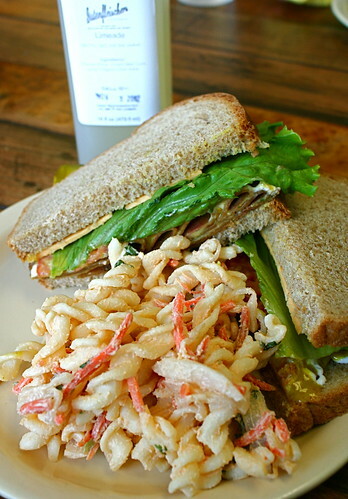 With shredded daikon & carrots, the mayo-based pasta salad is tangy and light, perfect with a sandwich, pickle, and a bottle of the in-house Limeade! From the to-go fridges, I picked up a tempeh bacon, tofu egg, and cheeze biscuit for the next morning’s breakfast (I felt so so about that after eating it…wasn’t my favorite, unfortunately), and a tub of vegan queso (cannot wait to try it! ), and then headed to the ‘burbs to spend some time with my brother and his family. Like I said, that day & a half wasn’t nearly enough time to eat everywhere I wanted to, but I think I put a good dent in my must-eat list. Guess I’ll just have to road trip back down south soon to pick up where I left off! You’re making me wish we still had friends in Atlanta. I missed out all ALL this great stuff the 3 or 4 times I’ve been there. In fact,I can’t think of a single food I ate while there on any trip…I guess it was very forgetable. I’ll be turning to your posts if I ever end up there again. I’m glad that key debacle aside you are having a great time! What a tour, and that picture of you with Becky and Adrienne made me very happy. I haven’t spent too much time in Atlanta, just enough for Soul Vegan. It was great to see you and share an awesome lunch! I kind of want to go buy 50 pounds of that pasta salad now. Aw, kittee, you’re always welcome at my place in East Atlanta! We’re midway between the soul Veg restaurants and down the street from $4 bahn mi and vegan pho! (And tons of other great stuff, of course!) Do visit again! Atlanta looks great! 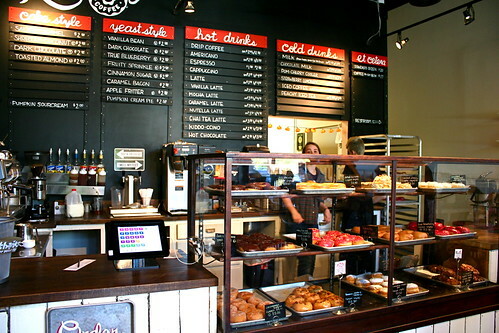 The doughnuts sound amazing, esp. the fritter (I WANT!) and it’s so cool that you got to meet the lovely Adrienne! Now you really have me wishing I was in Atlanta! The doughnuts killed me! So much variety! I think I would have had to order 20 of each. 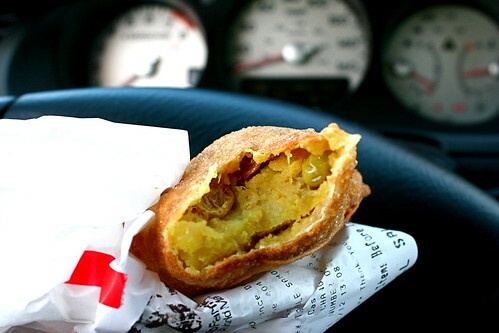 The samosa from the market looks so good – bad David Lebovitz! Bad!